Several game modes are also available. Apart from the traditional deathmatch (solo and team) and capture the flag modes, there’s a build and destroy mode that requires players to build half the map with their respective team in only five minutes. A firefight then ensues once you reach the time limit allowing you to play across the maps you’ve built. The defusion is another game mode. The build mode is the creative part that lets player construct their environments using different types of bricks. These bricks can be infused with bomb sites, launch pads and turrets. Winning a match or building maps lets a player earn in-game currency. This can be used to change your plain brick character’s look into whatever it is you like. 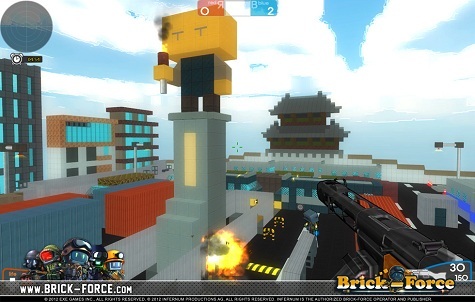 So far, some 1.5 million unique players have tried Brick-Force since it was released last year.